I had a story prepared for today’s post. Let me summarize. I was going to talk about Pasticcio and how I was first introduced this Greek dish by the wife of one of my dad’s patients. It was 1974 – the year we spent in Springfield, Massachusetts before my parents realized they had left their hearts in Seattle. Christina Papadorcopolis was a great cook, nice lady, and an incredible maker of almost life-size dolls which my four year-old self thought were the most beautiful things in the world. She taught my mom to make Pasticcio and Moussaka and Baklava – all things that remained in my mom’s cooking repertoire throughout my childhood. 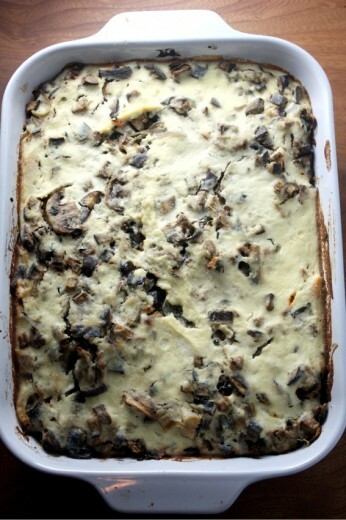 I liked Moussaka (yes, as a four year old) but I liked Pasticcio better because it had pasta in it. I was going to tell you about how we ended up in Springfield, the few memories I have from that year, etc. I often start posts in my head and yesterday, I decided to throw a load of laundry in and head up 2 blocks to get a coffee while I mulled over what to write. 20 minutes later I came home to water dripping down from the ceiling onto the stairs. I ran up to the laundry room and there was water all over the floor. My husband was away on a business trip and I did not even know where to start, who to call. A plumber? Sears? I opted for our builder who is also a friend. I have asked him to come over to change the battery in a chirping smoke alarm (our ceilings are very high and he is very tall) so I knew he would probably be willing to help. He told me he would head over and in the meantime, I found a repairman who could come that day. I will spare you the blow by blow but I will tell you that there was a small leak in the washing machine pump which was leaking all the water out of the drum. Enough water had accumulated in the ceiling of the main floor that a large hole had to be cut to allow it to stream out. There was a lot of soaking up water with towels, wringing towels out, crouching, running up and down stairs, and wiping, cleaning, sweeping, and mopping in the subsequent three hours. And I still made this for dinner. I’m not telling you this for a pat on the back (although, considering this husband-less week also included a 4am trip to the Children’s hospital ER, a spa day would be nice). I’m telling you this because if I could make this dish in the midst of wringing towels and holes being cut in my ceiling, and while still recovering from a sleepless night, you can make it too. I would imagine Pasticcio traditionally has meat just as Moussaka does. This version, courtesy of The Greens Cookbook, uses eggplant and mushrooms which are sautéed with onions, garlic, and fresh herbs. It is a super flavorful and hearty dish. The custard topping gives it a nice richness but there is not so much of it that it feels heavy. I have been making this dish for years and have tinkered with it to my taste (more pasta, less custard) and I have even, on days where there is plaster everywhere and my knees are soaked from washing machine water, used a bottled sauce. Place a large skillet over medium heat. Add just enough olive oil to coat the bottom of the pan and add the eggplant along with a large pinch of salt. Cook for 8 to 10 minutes, until the eggplant is soft and starting to brown in places. Toss frequently so it doesn’t stick. Remove to a bowl. Drizzle in more olive oil and then add the onions and a large pinch of salt. Cook over medium heat until soft, about 6 minutes. Add the garlic and herbs, cook for 2 minutes, then add the mushrooms. 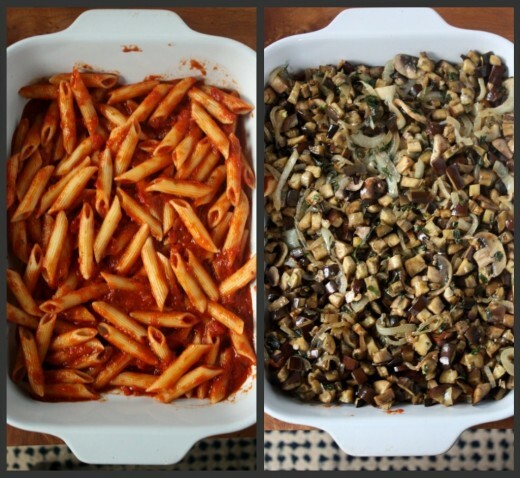 Raise the heat and cook until the mushrooms have browned and released their juices. Add these to the eggplant and season with salt and freshly ground black pepper. Bring a large pot of salted water to a boil. Add the pasta and cook until just shy of al dente (it will continue to soften while in the oven). Drain it in a colander and rinse with cold water to stop the cooking. Return to the pot and stir in ¾ of the tomato sauce. Combine the ricotta, eggs, and half-and-half in a small bowl. Add a quarter of the Parmesan and season with salt and pepper. Bake, uncovered, for 25 to 30 minutes, or until the custard has set and turned a golden brown around the edges. Add another five minutes to the cooking time if it the Pasticcio has been refrigerated. Allow the dish to settle for a few minutes before serving. What a week, Dana! However your meal sounds amazing. I have the Greens cookbook out from the library and I love it and don’t want to return it, which means I should just buy it. I’ll definitely try out this recipe for a bit of comfort when I’m having a rough week. I can’t even imagine making dinner if I had water pouring out of my ceiling! But, this looks like a fantastic meal. I’ve wanted to try a vegetarian pasticcio, and now I’ve found one. Greek food is one of my all time fave ethnic foods, but I feel like I miss out on so many of the meaty dishes. This vegetarian version looks awesome though! I’m trying to think of something comforting to say, but all I can think of is: thank god this happened to you and not me. For what it’s worth, I totally would let you use my washing machine, esp. if you’d bring me a nice big bowl of that pasticcio. 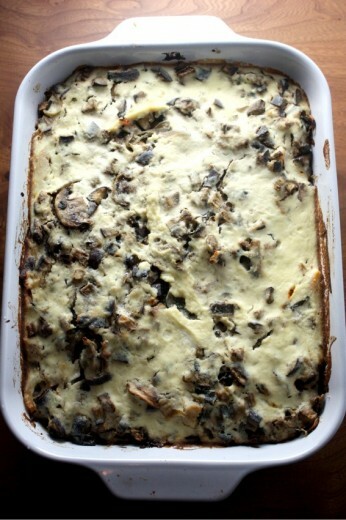 I have never made vegetarian pasticcio, but once made a vegetarian moussaka w/ lentils….and loved it. This looks like the real deal. Yum! Yes, water coming out of the ceiling deserves a spa day. I think I’ve heard of this dish but never knew what it was. Sounds and looks super yummy. Yes this would be a perfect recipe for those weekday dinners that need to be delicious, healthy and can be made ahead. Oh my goodness – this looks so good. And like something I have to make soon (first of all I have to make some more low acid tomato sauce so my husband’s tummy doesn’t flare up again). I feel for you with your water/ER visit/who to call issues and husband away – hopefully all is repaired, well and back home so you can get some rest. And it was delightful! Actually, not only was the pasticcio delicious, but the hostess was composed and upbeat and not even slightly worse for wear – which I would imagine is the bigger of two admirable accomplishments! Children’s hospital ER!?!? Is everyone OK? Good luck with that ceiling! I am still in shock over it! goodness woman i’m surprised you would even cook with all that drama. i would not have, it’s order a pizza time. i’m always so afraid to run the dryer while i’m away from home. you hear and see all those horror stories of fires. never thought about the washer. are the kids ok? with the trip to the ER? oh my god, i’m in. this looks/ sounds amazing. hopefully you’re having some time to relax now, after what sounds like a completely crazy week! Hope the boys are ok!! Wow Dana….that is pretty impressive! I am waiting for the day you decide to just order pizza or Thai food because your day was just too much to handle. I hope the ER trip wasn’t too bad, everybody is OK, and Randy gets home soon. This recipe is going to go in my what to make on a busy day folder. Can’t wait to try it! Yes, yes, yes, I will buy her a spa day. She deserves it and I know how good I have it. I tell her every day. In fact, all the Wootton boys know how good we have it and tell her every night, “thank you Mommy for the nice dinner”. Oh goodness, I’m so sorry about your washing machine! That’s the worst. We had our toilet leak once (seriously gross), and wringing out all those towels we used to soak up the mess was a serious arm workout- and that was with two people! I’m impressed you did it on your own. I love this recipe. I so often see versions of Pasticcio with meat, it’s great to have a veg option. Hope you have a chance to relax this weekend! You are in need of a vacation! Geeze. What a crappy weak! This looks fabulous… So sorry to hear about the washing machine! I hate when that stuff happens. Absolutely yummy recipe for dinner. Looks so good. I am so sorry for the trouble! Leaked washing machines are a pain. Dinner looks good, though, I don’t know how you did it (or do, regularly). Loved that Randy chipped in! You have very polite boys! I hope everything is sorted out in your house now! 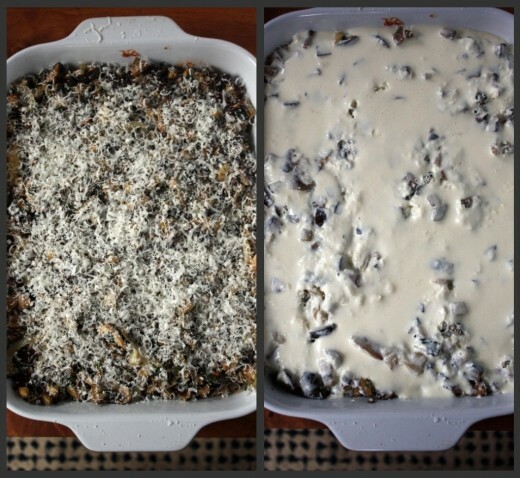 This pasticcio looks really good – I love the photos showing the layers.